- It weighs 38lbs with dimensions of 40 x 24 x 19 inches for length, width and height respectively. - It is powered by a 12v rechargeable SLA battery which works with a smart rapid charging technology for faster charging. - It is fitted with two motors that are designed to propel the electric car with two speeds; high speed and a low speed that ranges between 1-3 mph. - 2.4 GHz parental remote control that comes with a range of functions like forward and reverse controls that are meant to help keep your child safe while operating the electric ride on car. - It is fitted with a reliable electric braking system that guarantees gradual acceleration and swift braking when the child is using the vehicle. - It comes with one comfortable leather seat that has a five-point safety belt that keeps your child safe while driving the car. 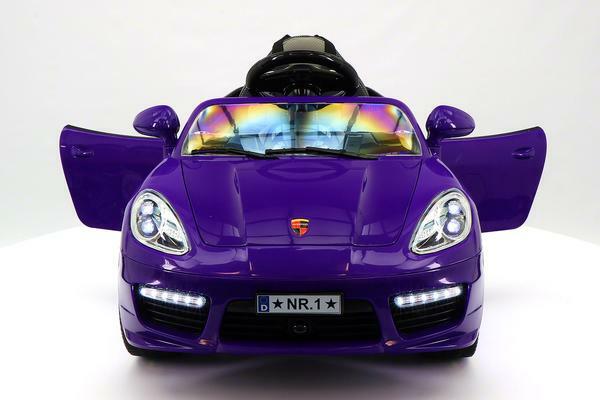 - It has a realistic imitation LED head light, fog lights, and Tail lights. - It is fitted with an integrated MP3 player that is compatible with a broad range of devices that you can connect and play music from. -It is designed with two fully functional doors on either side. Kids ride on toys are not without risk to your child since they involve some degree of speed and, this makes them prone to crashes. 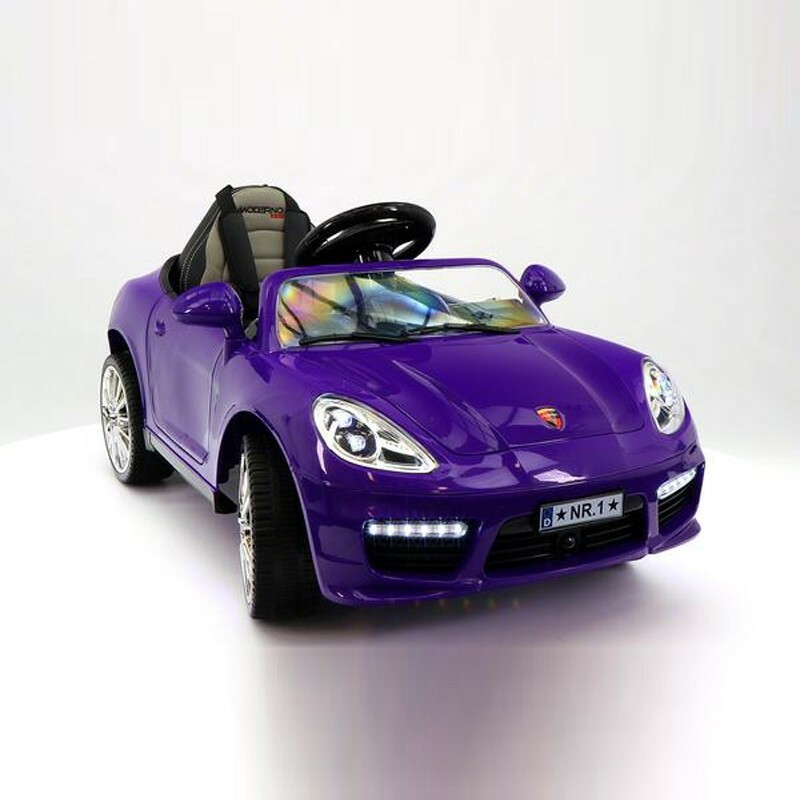 For this reason, this Porsche Boxster style battery powered kids car comes with several safety measures that ensure that your child is kept safe. First, it affords you the opportunity to control, remotely, the speed at which the child is driving the car. In addition to this, as a parent, you can be able to manipulate whether the car should go forward or reverse through the use of a switch on the remote control which will protect them from a crash. The toy is also certified as safe for your child to play with by the US consumer Toy safety standards. 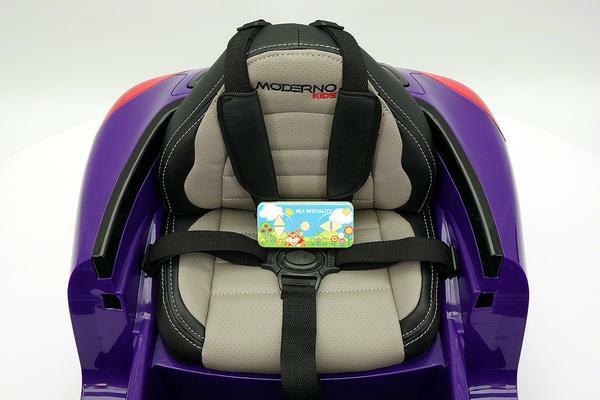 Moderno kids car is designed to look like a standard car, and so the manufacturer has made an effort to ensure that the safety features found in cars are also found in this toy. 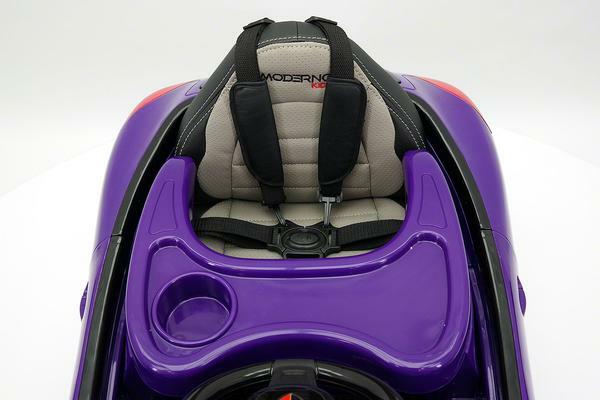 It comes with a seat belt that your child always has to be strapped on as they are driving. During their playtime, this will not only ensure that they are safe but also teach them a lesson on the importance of wearing seat belts while in the car. So as thy have fun, they also learn. Transporting toys can be such a headache, especially if they are large and delicate like most kids ride on toys. Moderno kids, however, have designed their Porsche Boxter style electric ride on car with features that make it easy to transport. It has a folding handlebar on the front part of the electric car, just below the front bumper and back folding caster wheels that collapse into the rear bumper when not in use. 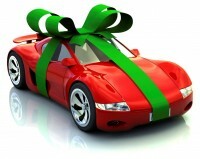 The handle and the wheel can be used to transport the car like luggage when the need arises. One of the challenges parents usually face is the assembly of the battery powered kids cars once they unpack them from the box. This Moderno kid’s car is designed to be as simple as possible so that anyone who wants to assemble it can do so in less than fifteen minutes. So you can disassemble the car once the child is done playing with it for storage purposes and when they need to play with it, they are assured it will be up in as little time as possible. Since this is an electric car, its battery is critical to it operation. First Moderno kids have ensured that the car can be charged in as little time as possible through the use of a rapid charging technology. Additionally, this technology ensures that the consumption of the charge on the battery is controlled to conserve energy and the battery does not overcharge. 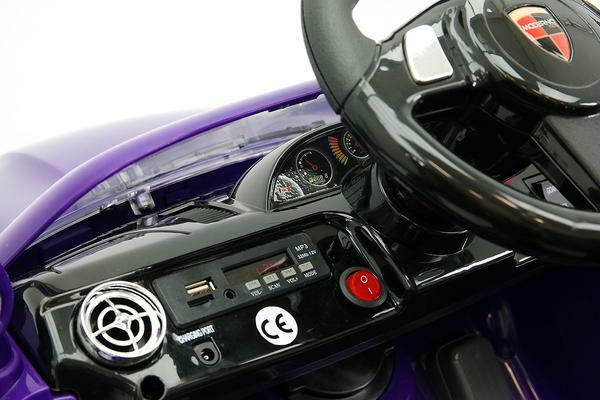 Typically, the battery will charge for one hour and guarantee the child 1.5 hours of playtime with the battery powered kids car. One other vital feature that this product comes with is an electric braking system. It is beneficial to have this element in an electric ride on the car because it will not only help your child stay safe during their play time but also save you the costs you would incur by repairing the car as the braking minimizes the knocking that can arise during their game time. - The space available in the ride on car is for only one child. In case you have two kids of the same age, who would benefit from playing with the toy together at the same time this is so limiting. -The car can only be ridden on flat paved surfaces, and this limits the spaces the child can play with the car especially when outdoors. You can have a large lawn on which they can play, but they will only be limited to the pavements as it doesn’t work for grass, sandy or muddy surfaces. Apart from the fact that the car does not offer much space that can accommodate more than one child and that it limits the areas in which the child can use it, the car comes with several benefits that are very important for your child’s safety, comfort and entertainment. On the strength of these benefits, it comes highly recommended.